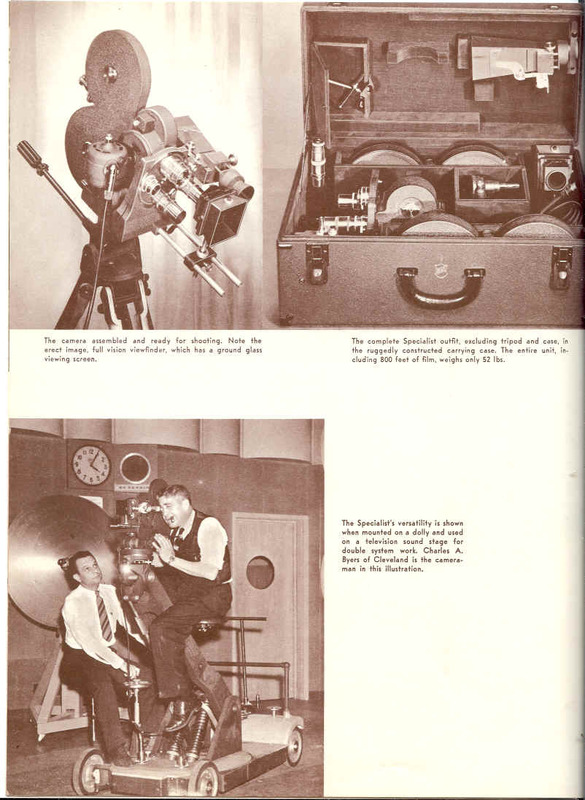 The Professional Equipment Division of Bell & Howell has supplied technical advice and equipment to numerous television networks and stations, having built up this service hand in hand with their long established role of supplying studio and laboratory equipment to Hollywood and the world. (Above) Chicago's WGN-TV newsreel cameramen are equipped with Filmo 70-DE's . . . Second from the left is Mr. F. Giese, manager of the newsreel staff, whose laboratory is equipped with B&H printer, projector and editing equipment. 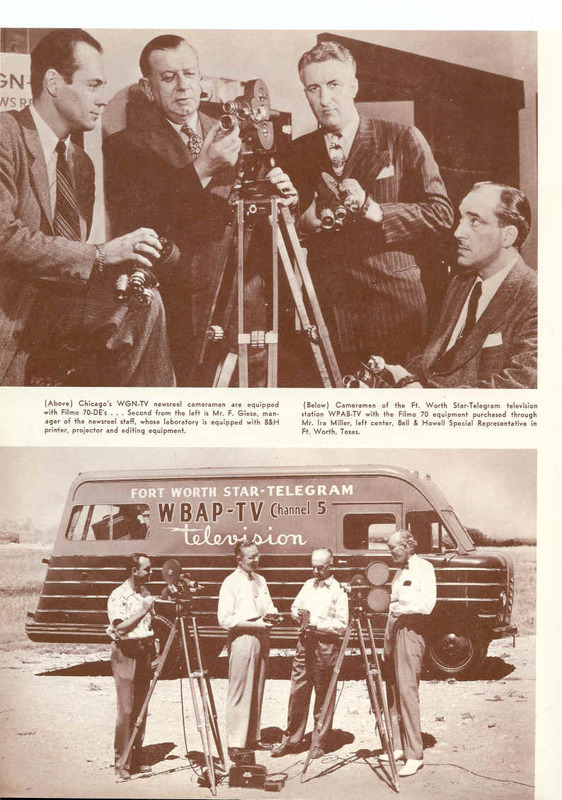 (Below) Cameramen of the Ft. Worth Star-Telegram television station WPAB-TV with the Filmo 70 equipment purchased through Mr. Ira Miller, left center, Bell & Howell Special Representative in Ft. Worth, Texas. The heartbeat of any film production depends upon the versatility and quality of the camera used. Bell & Howell is rightly proud of its contribution to the success of all productions photographed by the famous Filmo 70 cameras. 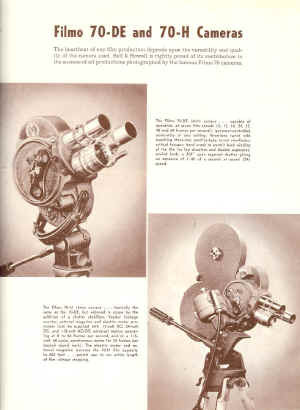 The Filmo 70-DE I6mm camera . 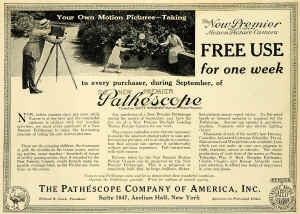 . . capable of operation at seven film speeds (8, 12, 16, 24, 32, 48 and 64 frames per second); governor-controlled accurately at any setting; three-lens turret with matching three-lens positive-type turret viewfinder; critical focuser; hand crank to permit back winding of the film for lap dissolves and double exposures; rewind knob; a 2040 open segment shutter giving an exposure of 1/40 of a second at sound (24) speed. The Filmo 70-H 16mm camera . 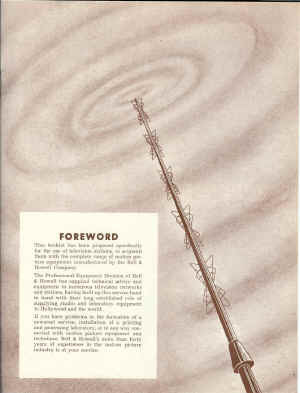 . . basically the same as the 70-DE, but widened in scope by the addition of a shutter stabilizer, Veeder footage counter, external magazine and electric motor provisions (can be supplied with 12-volt DC, 24-volt DC, and 115-volt AC-DC universal motors operating at 8 to 64 frames per second, and/or a 115volt, 60-cycle, synchronous motor for 24 frames per second sound work). The electric motor and external magazine increase the 70-H film capacity to 400 feet . . . permit user to run entire length of film without stopping. The camera assembled and ready for shooting. Note the erect image, full vision viewfinder, which has a ground glass viewing screen. The complete Specialist outfit, excluding tripod and case, in the ruggedly constructed carrying case. The entire unit, including 800 feet of film, weighs only 52 lbs. 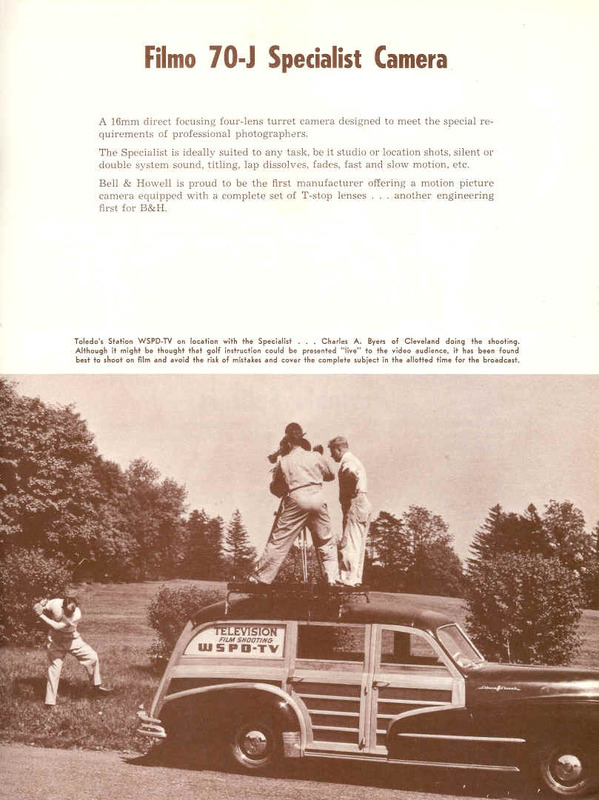 The Specialist's versatility is shown when mounted on a dolly and used on a television sound stage for double system work. 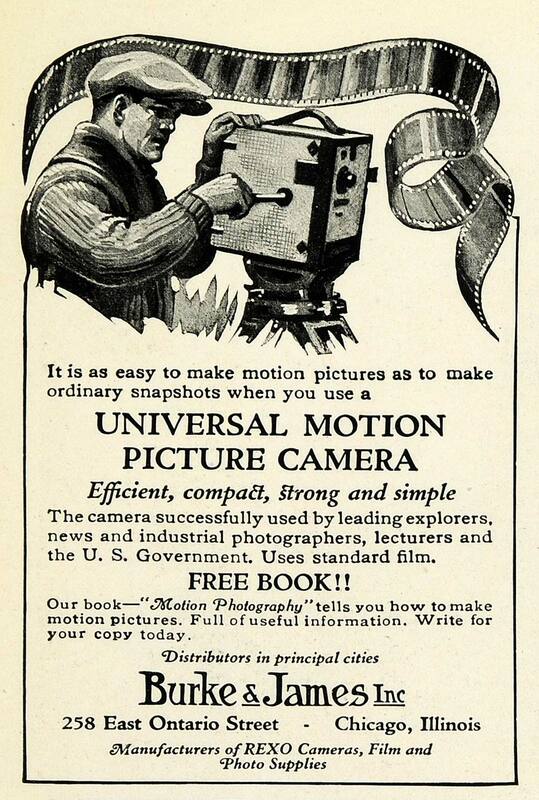 Charles A. Byers of Cleveland is the cameraman in this illustration. 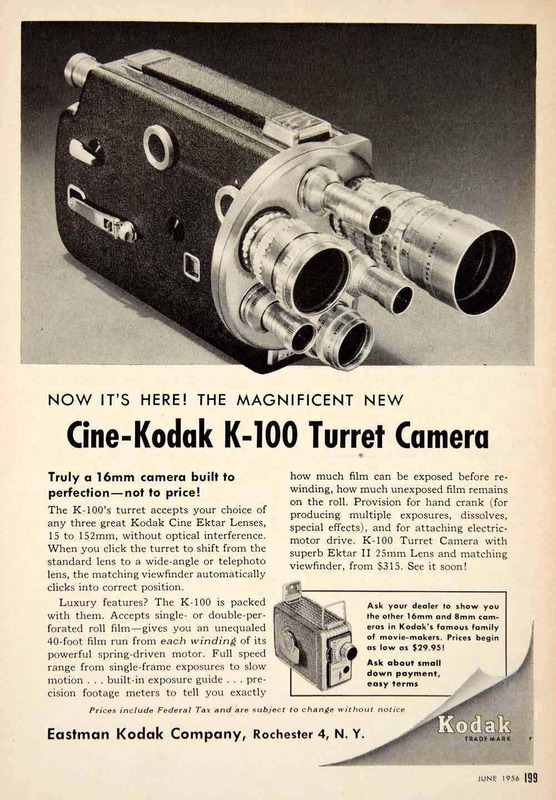 A 16mm direct focusing four-lens turret camera designed to meet the special requirements of professional photographers. The Specialist is ideally suited to any task, be it studio or location shots, silent or double system sound, titling, lap dissolves, fades, fast and slow motion, etc. 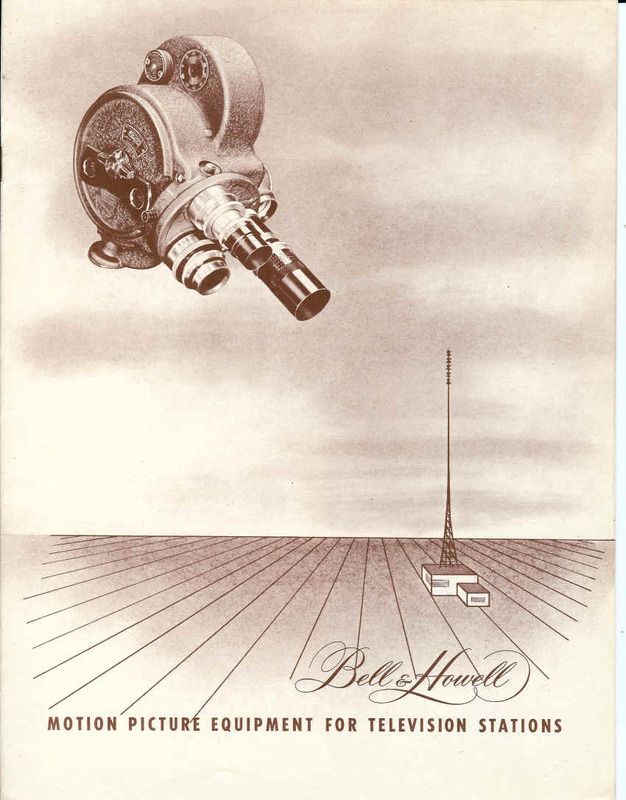 Bell & Howell is proud to be the first manufacturer offering a motion picture camera equipped with a complete set of T -stop lenses . . . another engineering first for B&H. Toledo's Station WSPD-TV on location with the Specialist . . . Charles A. Byers of Cleveland doing the shooting. Although it might be thought that golf instruction could be presented "live" to the video audience, it has been found best to shoot on film and avoid the risk of mistakes and cover the complete subject in the allotted time for the broadcast. 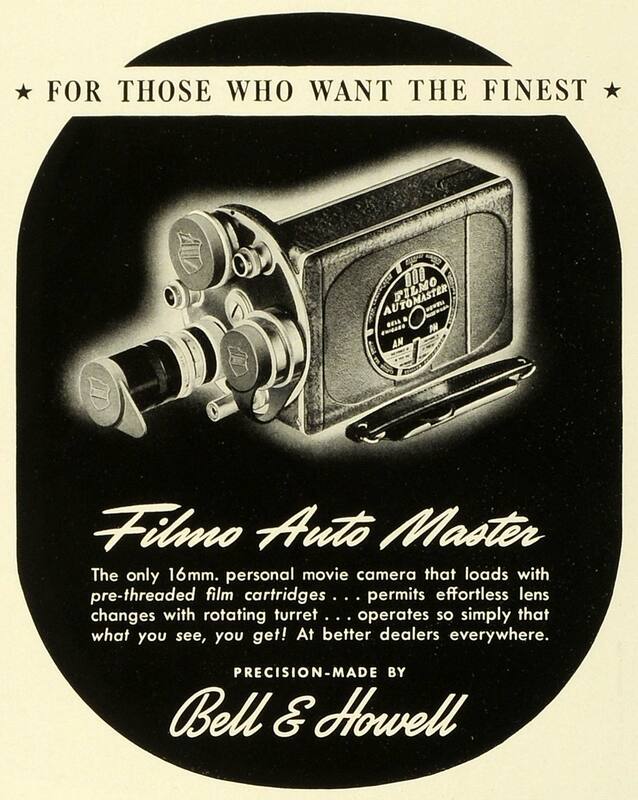 The Bell & Howell Filmosound is a definite "must" for editing and reviewing film. 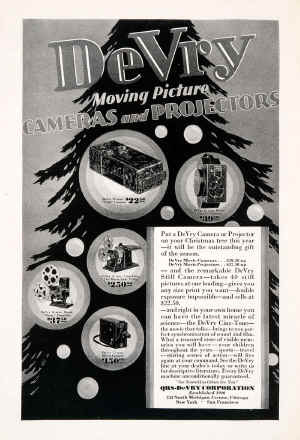 The finest projector obtainable for reproduction of sound films, it is used extensively for entertainment, education and industrial selling and training . . . is available in a choice of models. 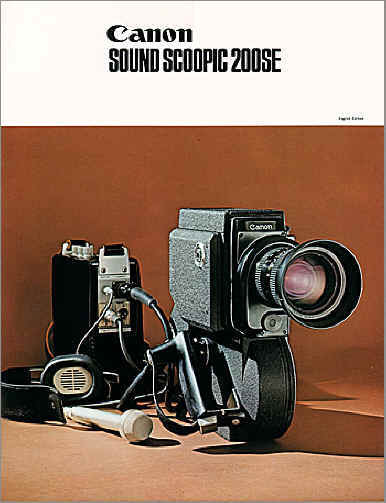 The Filmosound may be adapted with a 115-volt 50-cycle synchronous motor to project film in synchronization with a sound recorder, for dubbed in sound recording. Here are two new splicers that will have special appeal to film producers in the Television field. They are professional machines capable of making precision splices similar to those produced by the famous Bell & Howell pedestal splicers. A unique scraper for removing the emulsion is an integral part of the splicer, sliding in a channel which locates and guides the spring loaded scraping tool. It is impossible to damage the film by excessive scraping; with as few as three strokes the emulsion is cleanly removed, and when released the scraper slides back into the channel automatically. The scraper incorporates a Carboloy scraping tool which will last almost indefinitely without replacement or resharpening, being the hardest of all known metallic substances. There are two models available, one for 16mm and 8mm film, the other a combination 35mm and 16mm machine with retractable 16mm pilot pins. Both machines have an electrical heating element that operates from 110-volt AC supply, to heat the splicing blades and speed drying of the splice. 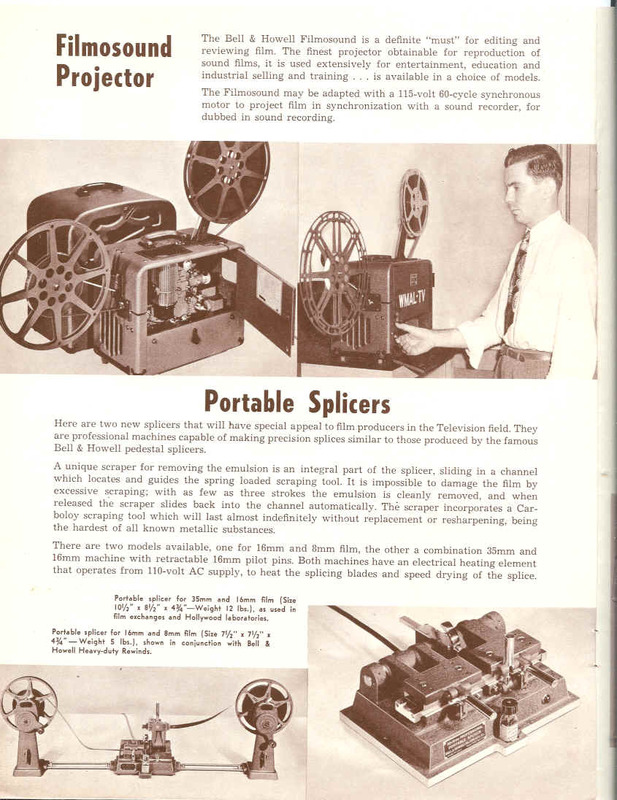 Portable splicer for 35mm and 16mm film (Size 10　1/2"' x 8　1/2h" x 4　3/4"-Weight 12 Ibs.). 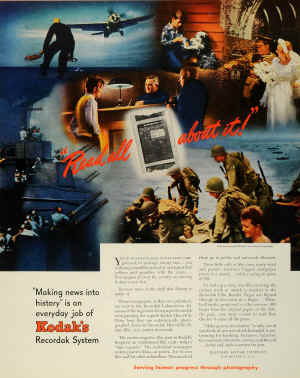 as used in film exchanges and Hollywood laboratories. 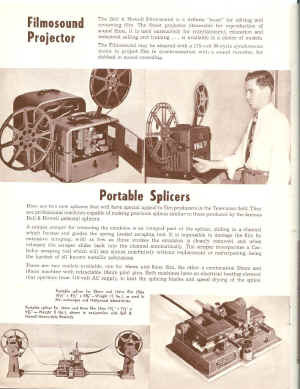 Portable splicer for 16mm and 8mm film (Size 7　1/2h" x 7　1/2h" x 4　3/4" - Weight Sibs. 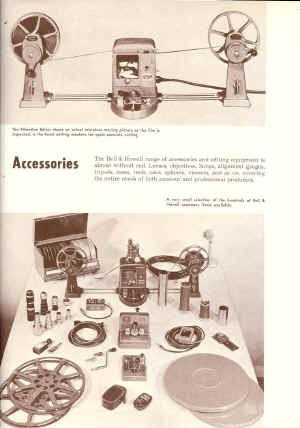 ), shown in conjunction with Bell & Howell Heavy-duty Rewinds. Most television stations exchange film material with their affiliates, particularly newsreel and sporting events of national interest. It is imperative that first class prints, comparable in quality to the original negative, be made. 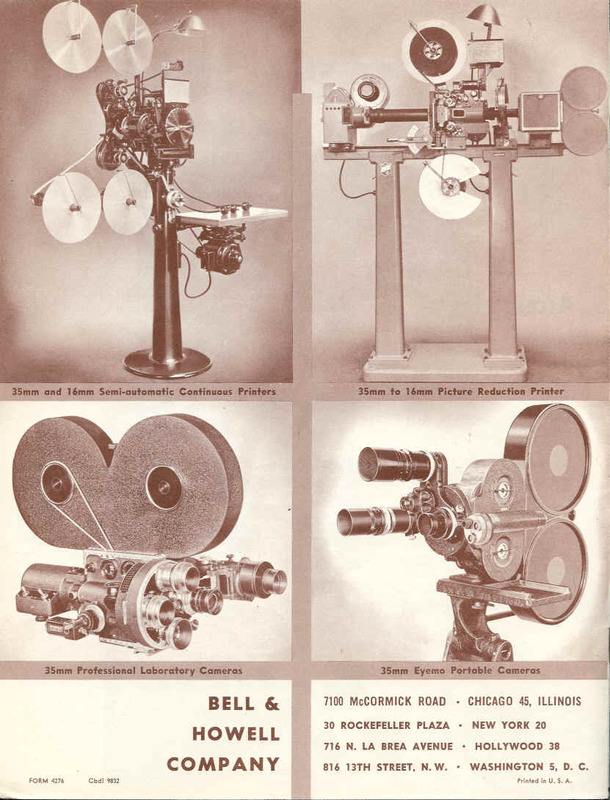 For over thirty years the major laboratories and studios throughout the world have relied on Bell & Howell to supply printing equipment, for making both 35mm theater release positives and 16mm films in every field. The Model J Continuous Printer is ideally suited to the requirements of a television station. A newly designed, selfcontained, high-intensity lamphouse is now incorporated, and the 300-watt projection type lamp with biplane filaments provides sufficient light for printing any type of black-and-white fine-grain film, and color film. The printer is the most important single item in your laboratory. 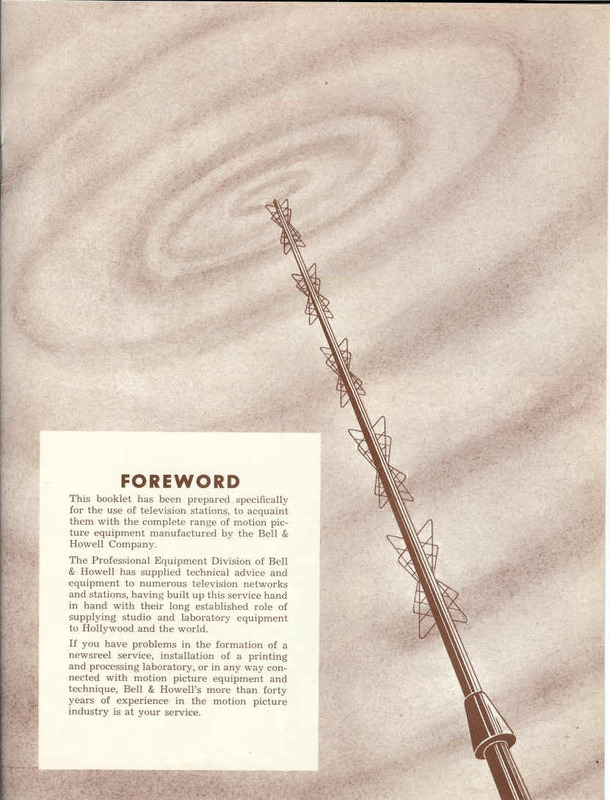 Consider the reputation of the manufacturer, machine performance and operation, and the Bell & Howell Model J will be your choice. 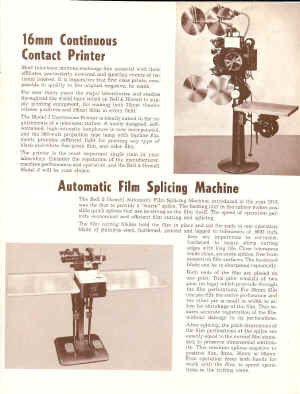 The Bell & Howell Automatic Film Splicing Machine, introduced in the year 1915, was the first to provide a "warm" splice. The heating unit in the splicer makes possible quick splices that are as strong as the film itself. The speed of operation permits economical and efficient film cutting and splicing. they are impervious to corrosion, hardened to insure sharp cutting edges with long life. Close tolerances make clean, accurate splices, free from cement on film surfaces. The hardened blade can be re-sharpened repeatedly. Both ends of the film are placed on one pilot. This pilot consists of two pins (or legs) which protrude through the film perforations. For 35mm film one pin fills the entire perforation and the other pin is small in width to allow for shrinkage of the film. This insures accurate registration of the film without damage to its perforations. After splicing, the pitch dimensions of the film perforations at the splice are exactly equal to the normal film standard, to preserve dimensional continuity. This machine splices negative or positive film, 8mm, 16mm or 35mm. Foot operation frees both hands for work with the film, to speed operations in the cutting room. 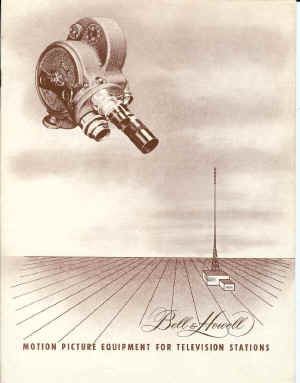 Bell & Howell Filmoarc projector head with General Electric Synchro-lite illumination. 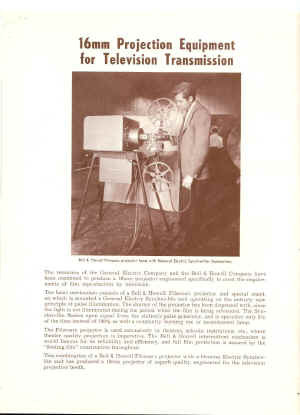 The resources of the General Electric Company and the Bell & Howell Company have been combined to produce a 16mm projector engineered specifically to meet the requirements of film reproduction by television. 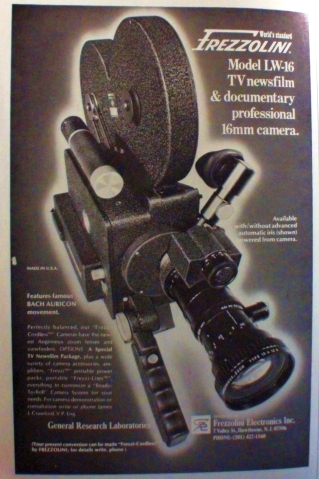 The basic mechanism consists of a Bell & Howell Filmoarc projector and special stand, on which is mounted a General Electric Synchro-lite unit operating on the entirely new principle of pulse illumination. The shutter of the projector has been dispensed with, since the light is not illuminated during the period when the film is being advanced. The Synchro-lite flashes upon signal from the station's pulse generator, and is operative only 5% of the time instead of 100% as with a constantly burning arc or incandescent lamp. The Filmoarc projector is used extensively in theaters, schools, institutions, etc., where theater quality projection is imperative. The Bell & Howell intermittent mechanism is world famous for its reliability and efficiency, and full film protection is assured by the "floating film" construction throughout. This combination of a Bell & Howell Filmoarc projector with a General Electric Synchrolite unit has produced a 16mm projector of superb quality, engineered for the television projection booth. The Filmotion Editor shows an actual miniature moving picture as the film is inspected, is the finest editing machine for quick accurate cutting. The Bell & Howell range of accessories and editing equipment is almost without end. Lenses, objectives, lamps, alignment gauges, tripods, cases, reels, cans, splicers, viewers, and so on, covering the entire needs of both amateur and professional producers. A very small selection of the hundreds of Bell & Howell accessory items available. 816 13TH STREET, N. W. • WASHINGTON 5, D. C.
FORM 4276 Cbdi 9832 Printed in U. S. A. The Frezzi LW16 is a sound on film camera designed for the newsfilm days when news stories were shot on film. It's a non reflex camera - The 12 to 120 Angenieux has a dogleg viewfinder. 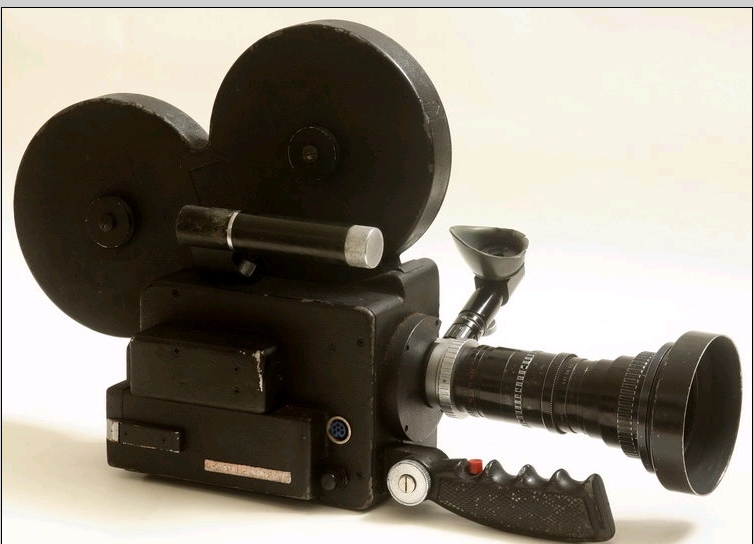 It uses 16mm film with a magnetic sound stripe (no longer made). 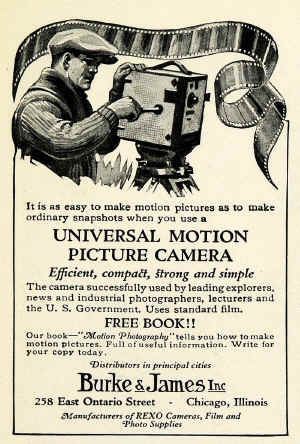 Professional CINE TELEVISION CAMERA. This is an original Gordon Yoder, model 31507. Yoder, who died in October, 2005, was the owner and operator of Gordon Yoder Inc. in Dallas, Texas. 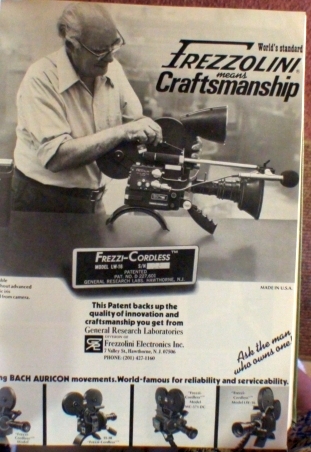 He developed a modification for the 16mm Bach-Auricon sound-on-film camera, expanding its film capacity to hold larger film magazines, incorporating a transistorized magnetic sound recording system, and using 12 volt synch motors. 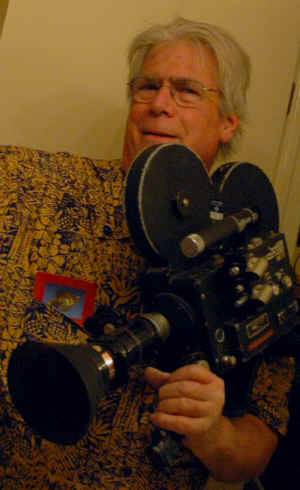 Many considered the Yoder camera a standard of the news film industry. Yoder’s converted camera meant that photojournalists could shoot longer than 2 minutes and 45 seconds. 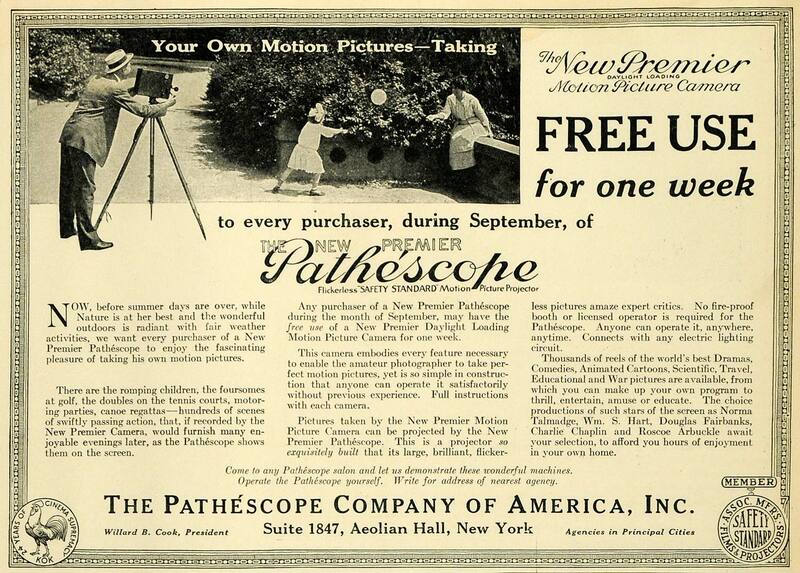 Before magnetic sound on film was invented, cameras weren’t portable. Sound was recorded optically. This required a big, heavy conversion box. 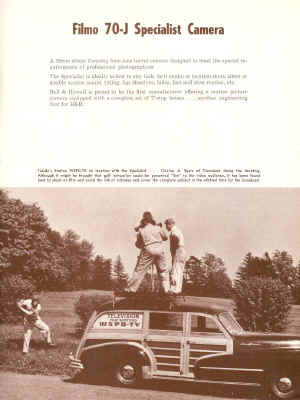 TV cameramen had to carry not only heavy battery packs (lead-acid, because Ni-Cads had not yet been invented), but also an inverter to convert the electricity to alternating current (AC). The Yoder-converted cameras, and the CP-16s that followed, revolutionized the way news was covered. This functional Camera weighs 10 lbs. Dimensions: 9 ¼” x 5” x 7”. This rare Camera comes in its original 27” x 10 ¾” x 15 ¾”, 12 lbs trunk (when empty). The auction also includes 5 film canisters, Two (2) 200mm Telephoto P. Angenieux Paris Lenses. One lens is a P. Angenieux-ZOOM, TYPE 10 X 12A No. 1209506; F.12-120mm 1:2.2. It is equipped with 72 M 9 TIFFEN Adapter Ring, Series 9, U.S.A. Second lens is the same except for serial number 1255457. Both Lens have EMS TV LEFF II hand written on them. Also included are two (2) All Transistor High Fidelity 16mm SOUND-ON-FILM AMPLIFIERS Filmagnetics by Bach Auricon, Filter, and BASF Blank SP52 Tapes. This camera originally belonged to KVOS-TV which can be seen in Bellingham, Washington, and British Columbia, Canada. The Camera works. However, we did not get any power cords. perhaps someone has cords we can use with this? We are looking for manuals, parts and a spare camera body....anyone have any leads? camera was found by a friend searching the Google Patent Database. batteries and an inverter to power it.